Stammering (also called stuttering) can affect people of all ages and is more common in males than females. Many research projects have been carried out to establish the cause of stammering. Stammering is variable, and the amount and severity of stammering can increase/decrease at different times, with different people or in different environments. It can also be affected by how the person is feeling. Consequently, words that can be said quite easily on one occasion, may be not be spoken fluently on other occasions. Sometimes stammering can be hidden (covert), where the speaker changes words when they anticipate a stammer. Or, they may avoid speaking in certain situations. Stammering/stuttering can be helped. 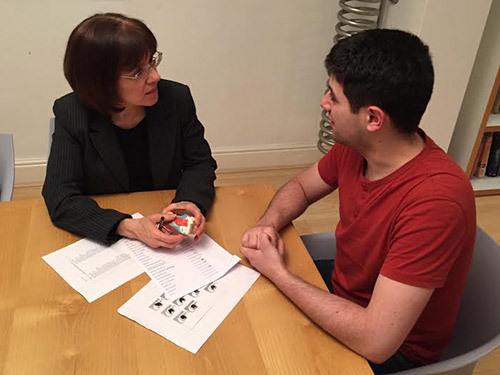 Specialist therapy can help both children and adults to increase their fluency and become confident and successful communicators whether or not they continue to stammer. Treatment will have a positive impact in the following situations: work, school/further education, meetings, making and receiving phone calls, talking in public, interviews, applying for promotions, forming relationships, belonging and participating, meeting new people, talking in public, expressing feelings, standing up for yourself and so on. You will gain an understanding about how and why your speech becomes dysfluent: how breathing is affected and how your tongue and/or lips may appear to stick when forming words. You will also gain insight into why words, which can be said effortlessly in one environment, are frequently blocked/stuttered in other situations – this is related to feelings of loss of control and /or anxiety about the environment and the listener. This is something that can be helped. You will learn effective and permanent fluency-shaping techniques. You will be supported through a series of graded exercises to achieve fluency and confidence in all speech situations. In her NHS role, Mrs Addlestone is head of the stammering service for children in a community setting and head of the stammering service for adults in a hospital setting – she both trains and supports junior therapists. She has extensive experience in diagnosing and treating stammerers and has training in counselling, family therapy and cognitive behavioural therapy. Mrs Addlestone has worked as a lecturer and examiner on the speech therapy graduate course at MMU (Manchester Metropolitan University). My son has had a stammer ever since he started speaking. He was referred to a speech therapist who he saw for 6 months. Although she taught him lots of strategies, he felt defeated by his stammer. He also got bullied in year 7 and his bully targeted his stammer. He became anxious about going to school and this made his stammer worse. When my son began seeing Sue, his confidence was at an all time low and he was stammering constantly. Sue managed to gain his trust with her honesty and determination. She has also helped him deal with a lot of the emotions he had bottled up - not easy for a 14 year old boy. Since seeing Sue my son’s confidence has grown. He is no longer defined by his stammer and he successfully uses the techniques Sue taught him. I would like to thank Sue from the bottom of my heart for everything she has done to help my son.